Pitchfork did a great feature on the Mau Maus’ Rick Wilder, along with video director Grant Singer. Below is a portion of it, click HERE for the full interview. When Grant Singer made “Dayzed Inn Daydreamz”, his third video for Ariel Pink’s album Pom Pom, the director relegated the singer to a cameo and gave the lead role to Rick Wilder. Shockingly thin, hair dyed marmalade orange, and a hoop through his right nostril, Wilder is an arresting figure. His character alternates between a dull job at a grocery store, drinking in a trailer park, and prancing on a bar’s stage in glittering silver pants.Though his sunken face is not familiar to most, Wilder once fronted the Berlin Brats, the group he founded in 1972 that Rodney Bingenheimer described as “the first real L.A. homegrown glam rock band” in the Los Angeles punk scene oral history We Got the Neutron Bomb. After the Brats broke up, Wilder lead the Mau Mau’s in various forms since the late 1970s, with sporadic recorded output. He is also interviewed in The Decline of Western Civilization III, the documentary made in 1998 but widely seen for first time with the boxset release of Penelope Spheeris’s series. After Singer got the opportunity to do three videos leading up to the release of the Weeknd’s new album Beauty Behind the Madness, he again brought in Wilder and made him a through line in this trilogy. In “The Hills” Wilder looms in the mansion that Abel Tesfaye hobbles into, in “Can’t Feel My Face” he throws the lighter that ignites the singer, and in “Tell Your Friends” he catches a couple bullets. With his hair slicked back and in dark suits, some have taken his character to represent the devil or the music industry (same diff? 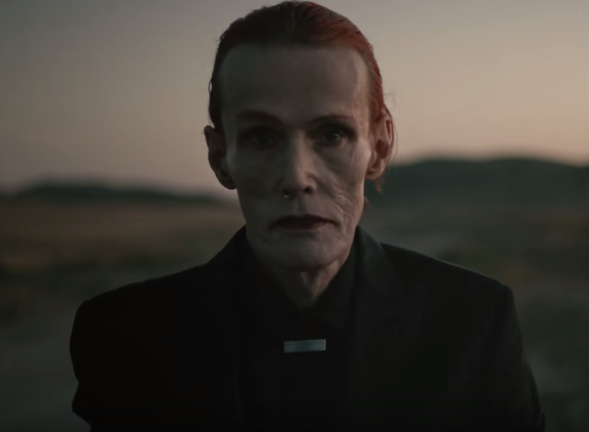 ), but in keeping with the Weeknd’s insistent opaqueness, Singer won’t really talk about the videos’ meaning or what it’s like working with the artist.Singer and Wilder have become friends over the past year and plan to continue collaborating in the future. At a restaurant in West Hollywood, the two talked about their relationship. Rick appeared on the Watt From Pedro Radio Show, click HERE to listen to the interview. The Mau Maus are appearing November 1st at Los Globos with San Francisco’s Avengers. The Mau Maus are appearing with the Dickies at the legendary Whiskey-au-go-go on Sunday Sept. 1st in celebration of Dickies singer Leonard’s Birthday Bash. You can access the Stench Radio archives HERE. Established in 1977, resulting from the breakup of their former band the Berlin Brats, the Mau Maus have a notorious reputation as trouble makers. 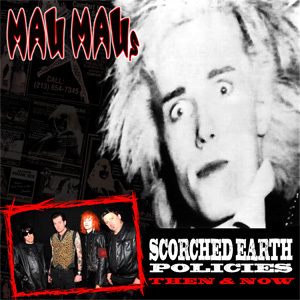 With the release of their first legitimate recorded album ‘Scorched Earth Policies: Then and Now’, the band has given their fans something tangible, as they have been craving for almost forty years. With the legendary Rick Wilder filling the position of front man; Robbie Krieger, Michael Livingston, and Greg Salva on guitar; Scott “Chopper” Franklin on bass; and Paul “Black” Mars on drums, the band has become an icon in the Punk scene. Though Wilder is the only original member still standing, all have a chemistry that is undeniably powerful. Their drive and ability to create a lasting sound has made them a permanent staple in the music industry. With a history like The Mau Maus, there is no escaping their reputation. Band members changing like the days of the week, cops appearing at their doorstep about five times a night, and starting uncountable riots, the band hasn’t just made their mark on music, they’ve made it on society. Incorporating both songs from their past as well as recently written and recorded songs from today, they have pieced together a compelling album that will be played for many decades to come. Kicking of their album with “(I’m) Psychotic”, they already paint a picture of just who they really are. The dominant bass line, sweet guitar solos, extremely fun chorus, and just about as much china as you can handle introduces The Mau Maus in the best way possible. “Warbaby” is the perfect song for one who’s looking for the angst expected from angry rockers. With impressive guitar riffs and a single amazing guitar solo the song has become a fan favorite. “Joyride (to the End of the World)”, written by Wilder, is one of the slower (however, not slow at all), and more powerful songs. “Doomsdaze”, one of the most enjoyable songs on the album, opens with the group yelling, “Yeah, yeah, yeah” which continues throughout the song, giving off the loud, rambunctious vibe loved by all Punk listeners. Though they’re what would be considered veterans of the scene, The Mau Maus plan on releasing another album in the future. With talent like theirs, there is no reason not to. The Mau Maus have been an influential band throughout the entire Punk industry since 1977 and are continuing to influence bands in today’s music scene.